Agrani Bank Limited Job Circular 2016. 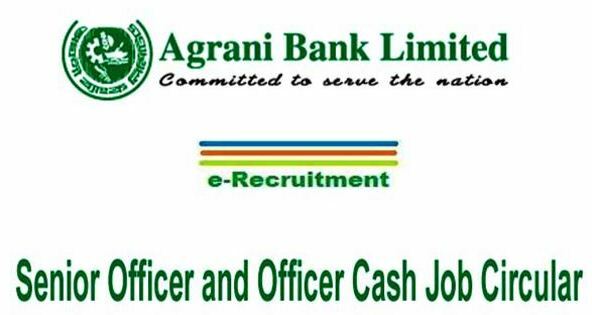 Recently Agrani Bank has published an appointment notice in 276 post of officer (cash). 276 appointments in Officer post in Agrani Bank. According to the notice, Male and Female who have post-Graduation are eligible to apply for the said post. The application process is already open and the deadline for applying is 11thJuly 2016. The applicant has to have Honors’ degree from any recognized university with second class or equivalent CGPA. But any third division or equivalent CGPA in any stage of the student life is not acceptable.In the case of the result in grading point system, according to the Education Ministry’s declaration on 02-06-2009 and 02-03-2019,the fist,second and third division will be fixed. But if the applicant is from English medium and has passed O level and A level, then equivalent certificate issued by the concern education board is required and if the applicant has a foreign degree then he or she has to collect the equivalent certificate of his/her degree issued by the University Grand Commission is required . In the certificate, the degree, CGPA, division all things have to be mentioned. Besides the educational qualification, the applicant has to be competent incomputingand the age should be maximum 30 years or less on 1st March.2016. But in thecase of freedom fighter’s children and handicapped, the age limit is relaxed to highest 32 years on the same date. For applying in this post, the applicant has to apply through Bangladesh Bank Website- https://erecruitment.bb.org.bd/ at this address. They have to log on this site and then click Online Application and have to fill up the form properly. Other term and conditions will be available on the website. After applying, the tracking number has to keep carefully for further use. After sorting the application, the applicant will be called for a MCQ and written test. Those who qualify in that test, have to submit the document,which he/she mentioned in the application form. After verifying these documents, the candidates will call for sit in a VIVA .Those whoqualify in the Viva will be appointed finally. The salary and remuneration will fix for the selected candidates as per the national pay scale of 2015. In that case, the candidates who finally qualify,their monthly salary will be 16000 to 38640/- Taka. They will be eligible to get other benefits as per the pay scale. Here you can get all Bangladeshi Government job circular.